Selenium is a key nutrient in horse nutrition and is crucial for an optimal antioxidant status and immune function. 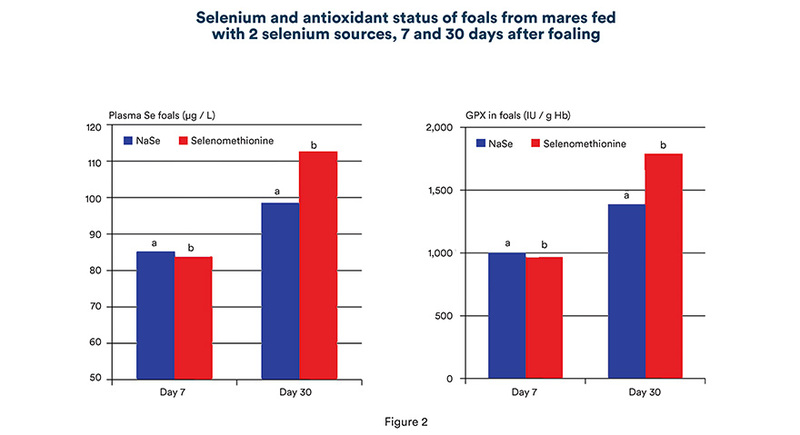 Trials done with a certain type of selenium fed to mares showed that it affects milk and selenium status of their foals. In forage and cereals, selenium is predominantly present in the form of selenomethionine, the natural form of selenium in plant protein. Generally the selenium levels in forage and grains are low, as majority of the soils are selenium deficient. Complementary feed provides the additional selenium to cover the daily requirements and overcome selenium deficiency in horses. The supplemented selenium can be either inorganic (often sodium selenite) or organic (selenised yeasts or selenomethionine). At the start of the trial, the selenium and antioxidant status of the mares was below the reference values. This can be explained by a low selenium levels in the diets that the mares received before the start of the trial, as the diets were practically based on roughage and cereals only. After 3 months, plasmatic selenium and gluthation peroxidase (GPX) increased as a result of selenium supplementation, independent of the source. 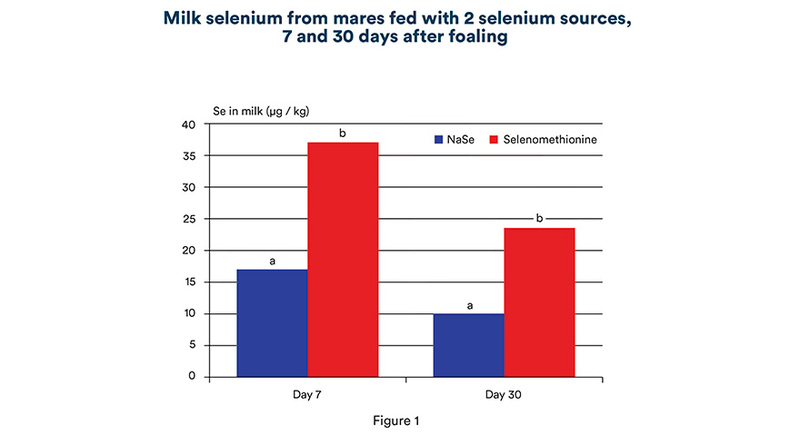 Mean selenium concentration in the colostrum was numerically higher in mares receiving the organic selenium source and reached a significant difference in the milk at day 7 and 30 after foaling (Figure 1). Higher selenium levels in the milk resulted in an improved selenium and antioxidant status of one-month old foals (Figure 2). One of the other selenoproteins in the body is iodothyronine deiodinase, a selenoenzyme responsible for the conversion of the pro-hormone T4 to its active form T3. These thyroid hormones play a key role in the metabolism for protein synthesis and energy production in the body. In young horses, some research has been carried out on the effect of glucose on T3 and T4, but there is very limited research available about the influence of selenium on the T3/T4 ratio. In the trial with mares and foals, the T3/T4 ratio was measured in foals at 7 and 30 days of age. At 7 days, the ratio T3/T4 was equal in foals from both groups. After drinking milk with higher selenium levels, the foals from the mares receiving selenomethionine, showed an increased serum triiodothyronine to thyroxine (T3/T4) ratio but this level was not significant. In further research, it would be interesting to investigate if this increase in T3/T4 ratio would have a significant effect in the long term. Osteocalcin and bone specific alkaline phosphatase (bone-ALP) are markers for the bone formation in young animals. Although the osteocalcin levels were not different in foals at 30 days of age, bone-ALP was significantly higher in the foals from the mares fed with selenomethionine. Interestingly, in an earlier trial it was shown that supplementation of selenium in combination with iodine to mares increased as well the bone-ALP as osteocalcin in their foals. These results suggest that selenium, probably in combination with iodine, has a positive influence on bone development in growing foals. 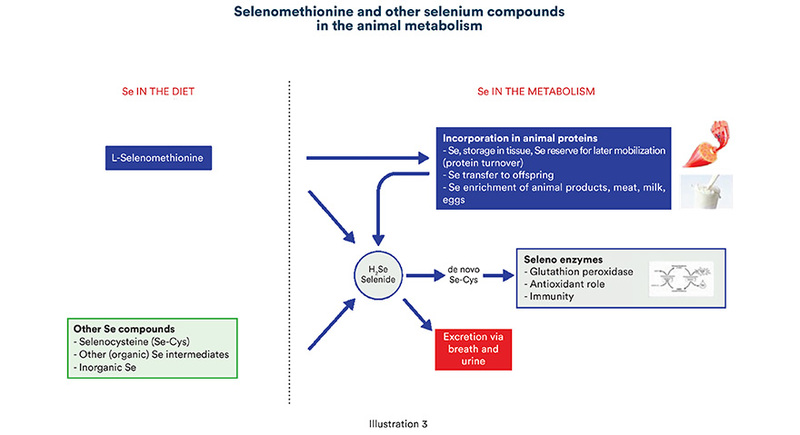 In the animal metabolism there is a difference between selenomethionine and all other forms of selenium. All selenium compounds are recognised for the supply of selenium and all can be used for selenoproteins (selenoenzymes) synthesis. Beside this general pathway, selenomethionine is utilised in the body as an amino acid and can be built into body proteins instead of methionine. Via this specific pathway, selenomethionine is able to build up selenium reserves in the body and is able to transfer selenium to the offspring through colostrum and milk. The selenium reserve can be mobilised for later selenoprotein synthesis. An adequate selenium reserve ensures an optimal selenium and antioxidant status at all times, even in times of stress or low feed intake. The beneficial effect of higher milk selenium is shown in the horse trial discussed above. Compared to inorganic sodium selenite, supplementation of mares with selenomethionine improved selenium and antioxidant status of their foals and seems to have a positive influence on bone development. The difference between inorganic sodium selenite and organic selenomethionine is shown in the horse trial above and explained in Figure 3. But what is the difference between the 2 organic selenium sources; selenised yeast and selenomethionine? The difference is in the concentration of selenomethionine in the product. Selenium yeast consists of up to 98% organic selenium, but not all this organic selenium is in the form of selenomethionine. Currently, EU legislation mentions that 63% of the selenium in selenised yeast should be in the form of selenomethionine. The remaining part of the selenium is in the form of selenocysteine, other (organic) intermediates or inorganic selenium. Selenomethionine is an effective organic form of selenium to increase selenium levels in the milk of horses. Higher transfer of selenium through the milk results in improved selenium and antioxidant status of the suckling foals. Additionally, higher selenium status seems to have a positive effect on the bone metabolism in growing offspring.